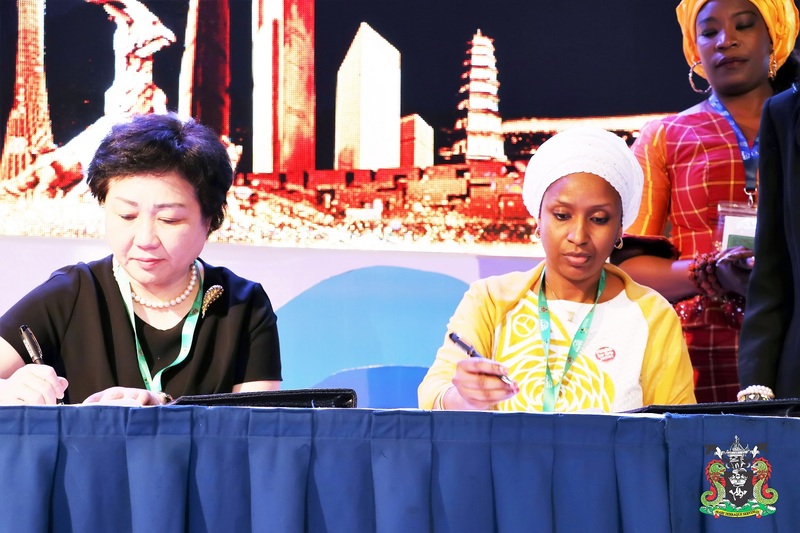 MD Nigeria Port Authority, Hadiza Bala Usman (right) and the Deputy Director General, Guangzhou Port Authority, China Yue Yuan (left) during the signing of the memorandum of understanding (MoU) on establishing sister Port relationship between the two ports at the 2018 IAPH Conference in Abuja. The MoU, which was signed on September 18, 2018 at the ongoing maiden African Regional Conference of the International Association of Ports and Harbour (IAPH) at Transcorp Hilton Hotel Abuja, would strengthen communication and cooperation thereby enabling synergy and collaboration amongst the two ports authorities. Guangzhou is the main transit Port of raw materials, energy supplies and Foreign Trade as well as the key support chain in Southern Region of China. In case of inability to perform any obligation as occasioned by the MoU, no party would be held responsible if the inability is caused by unforeseen or unavoidable circumstances, which whether accidental or not, is beyond the control man or any of the parties as a result of the aforementioned referred to as (FORCE MAJEURE).